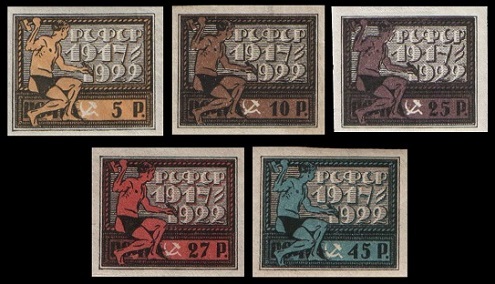 The postage stamps of Soviet Russia, for the period between late 1922 and and the Summer of 1923, begin to show the slow recovery of the Russian state from the previous year's economic hyperinflation. By the end of 1922, the Russian Civil War would finally come to an end, and the RSFSR would become the dominant player in the creation of the Union of Soviet Socialist Republics. 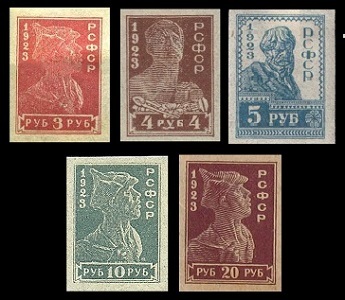 The five commemorative Soviet Russia stamps shown above were issued on November 8, 1922 to celebrate the 5th Anniversary of the October Revolution. The stamps are typographed and imperforate. The patriotic design features a worker carving the Cyrillic letters for RSFSR and the anniversary dates into stone. 05 R. (1922 - Sc. #211) - Ocher & Black. 10 R. (1922 - Sc. #212) - Brown & Black. 25 R. (1922 - Sc. #213) - Violet & Black. 27 R. (1922 - Sc. #214) - Rose & Black. 45 R. (1922 - Sc. #215) - Blue & Black. 25 R. (1922 - Sc. #213a) - Violet & Black. 27 R. (1922 - Sc. #214a) - Rose & Black. 45 R. (1922 - Sc. #215a) - Blue & Black. 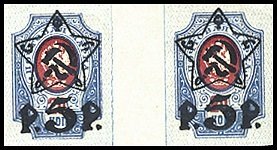 The Imperial Arms and post horns type stamps of the Russian Empire shown above were overprinted and re-valued between late 1922 and early 1923. 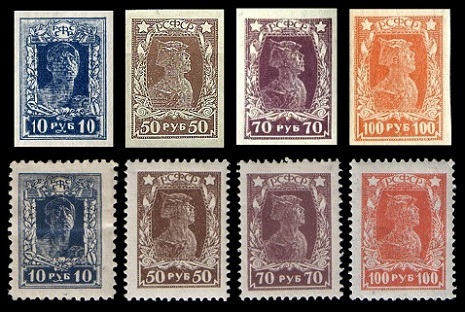 These stamps are referred to as the Stars Issue. 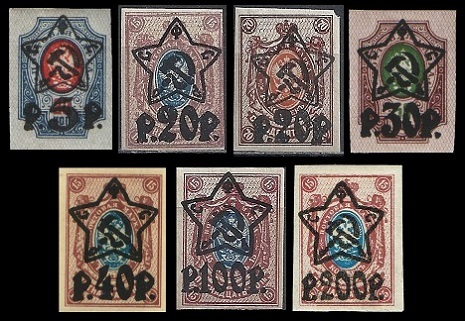 The overprint features a star with the symbols of agriculture (sickle) and industry (hammer), which would eventually be used as the national emblem of the USSR. 005 R. on 20 K. (1922 - Sc. #216) - Blue & Carmine. 020 R. on 15 K. (1923 - Sc. #217) - Red Brown & Deep Blue. 020 R. on 70 K. (1922 - Sc. #218) - Brown & Orange. 030 R. on 50 K. (1922 - Sc. #219) - Brown Violet & Green. 040 R. on 15 K. (1922 - Sc. #220) - Red Brown & Deep Blue. 100 R. on 15 K. (1922 - Sc. #221) - Red Brown & Deep Blue. 200 R. on 15 K. (1922 - Sc. #222) - Red Brown & Deep Blue. 005 R. on 20 K. (1922 - Sc. #223) - Blue & Carmine. 020 R. on 15 K. (1923 - Sc. #224) - Red Brown & Deep Blue. 020 R. on 70 K. (1922 - Sc. #225) - Brown & Orange. 030 R. on 50 K. (1922 - Sc. #226) - Brown Violet & Green. 040 R. on 15 K. (1922 - Sc. #227) - Red Brown & Deep Blue. 100 R. on 15 K. (1922 - Sc. #228) - Red Brown & Deep Blue. 200 R. on 15 K. (1922 - Sc. #229) - Red Brown & Deep Blue. 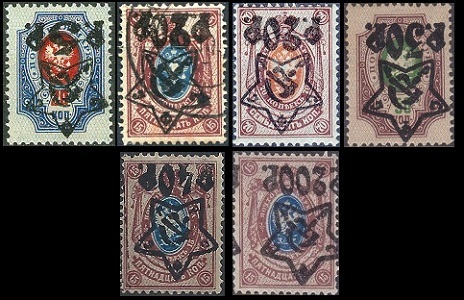 A lot of errors occurred during the production of these stamps, such as inverted and double surcharges. Examples are shown above. They are all relatively common. Please refer to the major catalogs for details. 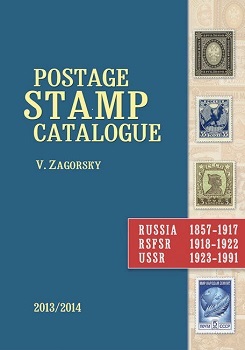 The four major type definitive Soviet Russia stamps shown above were issued in 1922 and 1923. The two common designs feature a Worker and a Soldier. 010 R. (1922 - Sc. #230) - Blue. 050 R. (1922 - Sc. #231) - Brown. 070 R. (1922 - Sc. #232) - Brown Violet. 100 R. (1922 - Sc. #233) - Red. 010 R. (1923 - Sc. #234) - Blue. 050 R. (1923 - Sc. #235) - Brown. 070 R. (1923 - Sc. #236) - Brown Violet. 100 R. (1923 - Sc. #237) - Red. 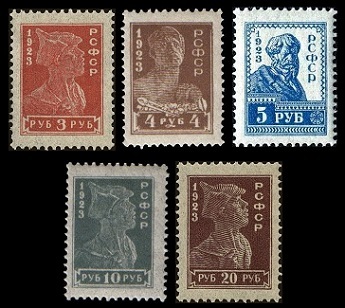 The five major type definitive Soviet Russia stamps shown above were issued in May 1923. 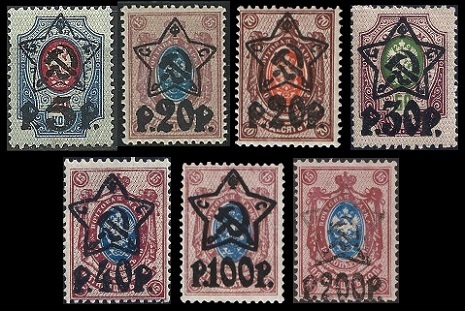 These would be the last postage stamps of the Russian Soviet Federated Socialist Republic. The three common designs feature a Soldier, a Worker, and a Peasant. 03 R. (1923 - Sc. #238) - Rose. 04 R. (1923 - Sc. #239) - Brown. 05 R. (1923 - Sc. #240) - Light Blue. 10 R. (1923 - Sc. #241) - Gray. 20 R. (1923 - Sc. #241A) - Brown Violet. 03 R. (1923 - Sc. #238a) - Rose. 04 R. (1923 - Sc. #239a) - Brown. 05 R. (1923 - Sc. #240b) - Light Blue. 10 R. (1923 - Sc. #241d) - Gray. 20 R. (1923 - Sc. #241c) - Brown Violet.